Food courts ar e believed to be a highly profitable business field, which explains why more and more investors have poured their money into the field. “The retail premises rent is relatively high. But if you can do business well, you still can make profit,” said Vo Ngoc Quang, Chair of Sang Tao Company, the owner of Food Creative. The food court is located on the fourth floor of Bitexco building in HCM City, where the retail premises rent is sky high. The 30-year old owner declined to reveal the sum of money he has to pay for the 70 percent of the total area of the fourth floor (the other 30 percent has been leased to BHD Cinema). A report of CBRE Vietnam, a real estate service provider, said that the retail premises rent at Bitexco’s building was $40-50 per square meter per month. If so, the retail premises rent alone costs Food Creative $64,000-80,000 a month. Food Creative comes forward and leases the whole premises here and then re-leases parts of the premises to other food shop owners. The special characteristic of a food court is that the investor, like Food Creative, collects money directly from customers. Customers pay in money to cards and bring the cards to the payment counters. Then the investor would remit money into the accounts of the investors, who re-lease the premises, twice a month. Food Creative earns 17 percent of the total revenue from foreign brands and 23 percent from domestic brands. The rents here can be classified into several groups. The rent is $1,500-2,000 a month for a kiosk (12 square meters), reserved for drinks shops. Meanwhile, food brands have to pay $2,000-3,000 for a 19 square meter kiosk, fast food brands $5,000. “If the business goes smoothly like now, I would be able to make profit after 8 months,” Quang said. The investor said that there are 520 seats at the food court, which are fully occupied in the lunchtime, mostly from the office workers at the Bitexco’s building. The proportion is 65-70 percent for dinners, mostly the current visitors and those who come to watch film at BHD. Also according to Quang, a serving here costs VND15,000-120,000, while 500 food dishes are on the service. 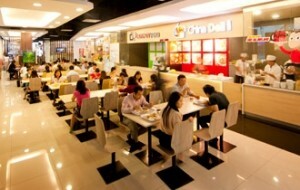 Experts say the food court model has been existing in Vietnam over the last 10 years. The first food courts were the ones located at Diamond Plaza, a shopping mall, then at Parkson, Now Zone and Crescent Mall systems. A survey has found that food brands like setting up their shops at the food courts, because the existence of many shops in the same area would help attract more customers. The major advantage of the model is that food brands can lease retail premises at lower costs than the costs for separated premises. However, the experts say the challenges are really big. It would be risky for the investors if they cannot find enough premises tenants. Especially, they have to pay very big sums of money for initial investments, including the spending on interior decoration, kiosk design, air conditioning system… The items cost Food Creative VND12 billion.